Remember when I posted these, and wrote about the instant aversion my kids have towards meatloaf? They can’t get enough meatballs, but when I use that same recipe and make a loaf out of it, something happens. Well, I just solved the problem for all the mothers out there looking to get their kids to eat meatloaf. MEATLOAF CUPCAKES!!!! The other week a friend of mine at work came by to tell me about this awesome bakery in Chicago, called the MeatLoaf Bakery. She described the meatloaf cupcakes and instantly my mind went racing – mostly to the decorations. Bacon, chives, shredded cheese, black olives, a ketchup dollop on the top – I just couldn’t stop myself. Then reality set it – but would my kids actually get into this? Oh boy did they ever. They begged me to make them every night for weeks, until I finally got up the nerve. Mostly I was concerned about piping the mashed potatoes, I wanted to make sure I make them creamy enough, yet mildly stiff, so that they would hold their shape perfectly. Mashed potatoes were never my strength. Well – I went with two recipes from Cooking Light (adapted slightly), and they were winners. The kids loved EVERYTHING about these cupcakes – they even ate the mashed potatoes which I have never been successful at getting them to eat. These were just about the greatest dinner ever. Heat the olive oil in a large nonstick skillet over medium-high heat. Add chopped onion, chopped carrot, dried oregano, and minced garlic; sauté 2 minutes. Cool. Combine onion mixture, 1/2 cup ketchup, and the remaining ingredients except cooking spray in a large bowl. While the meatloaf is cooking, make the mashed potatoes. Place potato in a saucepan; cover with water. Bring to a boil; cover, reduce heat, and simmer 10 minutes or until tender. Drain. Put potatoes into a ricer for best results. Return potato to pan. Add milk and remaining ingredients; stir with a spoon to desired consistency. If they are not creamy enough for you, add up to 1/4 cup more milk – although they need to be stiff enough to pipe on top. Put the potatoes into a pastry bag with a wide star tip and pipe the mashed potatoes on top of the meatloaf. Sprinkle with bacon crumbles and chopped chives. oh my gosh, that is the cutest thing i’ve ever seen!! i have to try this the next time i make meatloaf!! I will have to try these! They looks so good! Great recipe idea for meatloaf! They look even better than those from the Meatloaf Bakery. Love it! Thanks Karen, and again, thanks for the idea!!! These are so cute – I can’t wait to try these on my kids! Please do – and let me know what they think of them! i am so amazed.. Got some lean beef on sale and thought , gee why can;t I put meatloaf in a muffin pan and make meat loaf cupcakes for just my husband and I. They came out wonderful. . I looked on the internet and found you. Thank you so much for the great ideas. I must say, cupcakes are really the “IN” thing. Every birthday party, or any other party for that matter would have a cupcake centerpiece or cupcake giveaways and other cupcake stuff. I have never tried a savory cupcake that is why I am very eager to try this out. I love decorating cupcakes and I am sure I can use the same styles with this meatloaf recipe, but this time, I’ll be using cream, catsup, mustard (perhaps….) and bacon bits instead of candy sprinkles. 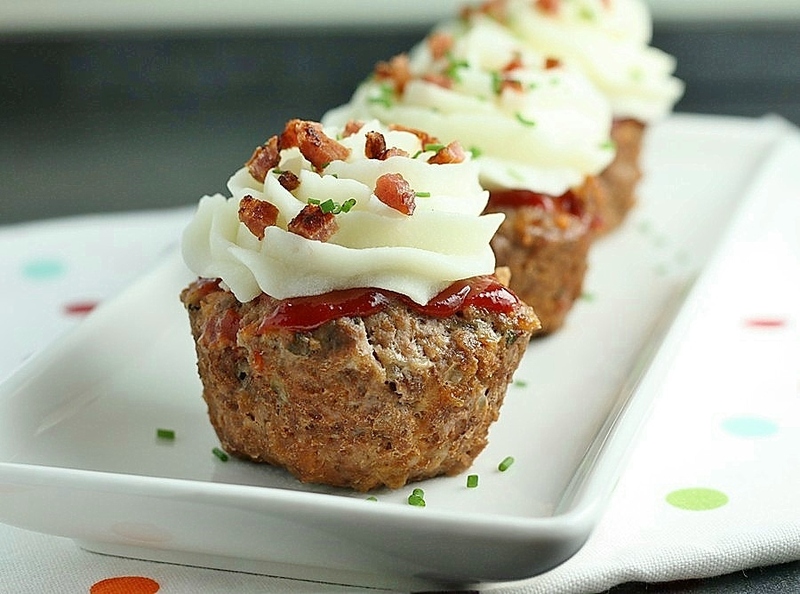 I can’t wait to get my hands busy with these cute meatloaf cupcakes! Brilliant post! Very creative! My husband isn’t really into cupcakes – but this may change his mind. This could also be a great finger food for parties. Oh yes, I didn’t think of that – making them in mini-muffins tins would be adorable!! Have you or anyone else tried these in mini-muffin tins? i know it’s been a few months since this comment above. I was just wondering if you had experimented with the time required to cook in the mini size. I never did try these in a mini-muffin tin. I would just cut the time in half, depending on the size of your mini tins. I made them in a mini muffin tin. It made more than 24-closer to 30, I think, so I had to do two batches. I baked them for 15 minutes (they were done) drained the grease off, let sit for 5 minutes, then flipped gently onto a baking rack and put them in the fridge to firm up-Dont handle til they’re firm, or they’ll split really easily. Thanks for the information Jamie – I hope you liked them! I still haven’t tried the mini variety, but I am sure they looked adorable! These are adorable!! Love your blog! Thanks – adorable and nutritious, the best combination! This might be the sexiest meatloaf I have ever seen! Well done! This is the best idea for kids! I never would have thought of this. However, if I had kids these probably wouldn’t just get eaten by them… These are much more fun than the regular version. This is awesome! It might even get me to eat meatloaf! I mean how cute are these Dawn?! I have to learn how to do piping like this – and I have to find this bakery! We’re down in that area at least once a week…I’m thinking that might be a good lunch stop! Love them! What a wonderful idea! I’ve enjoyed the treats at Meatloaf Bakery. They have a marvelous array of creative combinations. I never thought about trying it at home until now. My daughter would love (and eat) these! Thanks – and I am sure she will love these!! Thanks Sarah – I love them both! If you have to make them ahead of time, I would just make the meatloaf cupcakes, then warm them up while you make the potaotes and then pipe them on right before you are ready to serve. Good luck!! I made these for my boyfriend’s birthday and they were so good!! LOVE this recipe!! I just made these on my blog http://www.azestybite.com/2012/02/meatloaf-cupcakes.html. They turned out so good and so cute. Job well done! I will have to try these! They look so good! Great idea for a meatloaf recipe! You will love them, thanks so much! Adorable, and I’m sure VERY tastey! My daughter and I just made these to play an April Fools trick on my husband. He completely fell for it but finally tried them and loved them. Everyone said that we have to make them again. Thanks for the great recipe!!! I love it – great April Fools trick!! I made these last for dinner using your exact recipe! They were fabulous!! The meatloaf is very flavorful and moist and the potatoes were the perfect tasty topping. I just scooped the potatoes on top for a more rustic look and they were so cute and so delicious. I’ll be making these again! Sorry, I make these meatloaf cupcakes, and they were the worst meatloaf I have ever eated. No flavor there at all. Followed the receipe just how it was printed. Will not ever make this again. I had to throw this away in the garbage. It was that bad. Sorry to hear that – so many other people have loved the recipe. Everyone has different tastes! I would think you could you pretty much your favorite meatloaf recipe…just a thought. My family liked them just as they were, thank you Dawn for this fun idea! My kids love cupcakes and now they love “meatloaf” cupcakes. Your welcome, they are so delicious and fun!! Made these for dinner tonight and they were a huge hit! My husband just kept smiling and shaking his head, it was funny. They tasted great (can’t believe one person commented they were gross and threw them away!) – they were fun to make and eat. Definitely will make them often. I didn’t use regular cupcakes, I had a jumbo muffin pan and used that instead and they were the perfect serving size! Sounds great Jill – so glad they turned out so well!! Dawn what r the calories on one of these? I actually don’t know – but the meatloaf recipe is based on a recipe from cooking light. I hear there are some sites that you can plug ingredients into and get the caloric information. we like meatloaf so I will made my usual meatloaf with our usual mashed potatoes and I am sure they turned out the same way. We like it spicy..so I use celery, onion, and jalepeno with the garlic..I use basil in my italian dishes, so I didnt use it in this..I also like to use a mild BBQ sauce on it instead of Ketsup..Husband hates ketsup sooo..I love the idea of the “Cupcake” part as this has forced my family to get fixed portion sizes, to cut down on his weight.It worked. Instead of him cutting Huge pieces, he gets just the amount you would get in a 4 oz portion. Husband has lost 12 lbs so far, using the cupcake size portions on many of my meals. I have also made this in the Chicken Pot Pie recipe..He loves both..Excellent Idea my dear..clearly a winner..I dont care what the nay sayers say..its great. Thanks for sharing it. Have you ever tried making these and then freezing and just taking out what you need for dinner? I haven’t, but that seems like a great idea!! I have, I’m an older single lady, and meatloaf is a favorite, but usually too much for me, I tried the ‘cupcake’ and froze them, then seal them with a vacuum sealer… turned out great!! Now I can have a meatloaf cupcake whenever I want one. Great idea! How many does one recipe make? I believe it made 12 muffin sized cupcakes. Try with mashed sweet potatoes as the “icing”…. so good! the sweetness of the potatoes and the meat compliment each other so well :) For the mashed sweet potatoes I just peel, chop, and boil them and then mash them with 2 tbsp apple juice concentrate and some milk (almond milk works great too for a dairy free option.) Thanks for the great recipe! Sounds like a great idea!!! You did a great job!!! I would eat them in a second :). Hi! Just wanted to give you a heads up. Found someone posting your photo and full recipe on their FB page here https://www.facebook.com/photo.php?fbid=616974951649585&set=a.237180406295710.82523.224205730926511&type=1&theater. They even had the audacity to add text to the photo complete with poor spelling. The photo has a crazy amt of shares too. Feel free to email me if you need the link to file a copyright violation with FB. I have had to do it many times. Sad that people have to find their content elsewhere can can’t come up with their own. 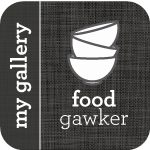 My email is InTheKitchenKP at gmail dotcom. My dad made them for me today as a birthday treat after i postd this on my facebook.. he is a chef so he used his own twist on the meatloaf and they were yummyyy!! Happy Birthday to me!! That’s awesome!! I’m sure if he is a chef, it was amazing!! Happy Birthday!! I love these and am planning on making them for a party. Here is my question….has anyone every made these with prepared mashed potatoes, like Bob Evans ? Also, would like to try reheating with potatoes to get a “twice baked” effect. Anyone? I have not – maybe someone else? Delicious!! On my third time making it. Family loves it. When I reheat the leftovers at work, I get asked what that great smell is. Excellent – so glad you like them! how much do you spoon into the muffin tin? Will it shrink down much? I was thinking of using an ice cream scoop. It will shrink a little, so make sure you put enough in. Yes, an ice cream scoop is what I do. thank you for this recipe! It was delicious!! Great recipe – so yummy!! Is there a nutitional guide for tbese? I made them today with slight chamges but have to keep track of calories fat and protein etc. Thanks! If you look on http://www.cookinglight.com, you will be able to find some similar recipes with nutritional information. I made these with vension meat and microwave potatoes. My husband can’t quit talking about how delicious they were!! Sure, I don’t see why not? Can I so these in foil cupcake papers? I made these last night for my family and followed the recipe; they came out amazing! My family loves them. This was a quick, fun, nutritious, and delicious meal! Thank you so much! I know this May sound nit picky but with the breadcrumbs, are you using the store bought or fresh/toasted or fresh and not dried at all? You can use either one – but if you use store bought dried, then it is good to moisten them with milk. Followed the recipe EXACTLY!!! But mixture is too liquidy!? Do I just add more breadcrumbs? Yes, ground beef can have a different amount of water. I hated this dish, it tasted distusting, i rate it 1 out of 5! Is there a place on this site for nutritional info such as fat, fiber, carbs, etc? It already looks very diet friendly & delicious! I tried to make these a couple of months ago, but they came out of the muffin tins like meatballs. What did I do wrong? You really have to level the meat with a spoon, so that you are not just adding a meatball to your muffin tin. It also helps to make a little well in the center – and make sure the meat is touching all sides of the muffin tin. My wife loves cooking recipes, this would thrill her. I love these! I’ve made something similar in the past, but never this pretty. 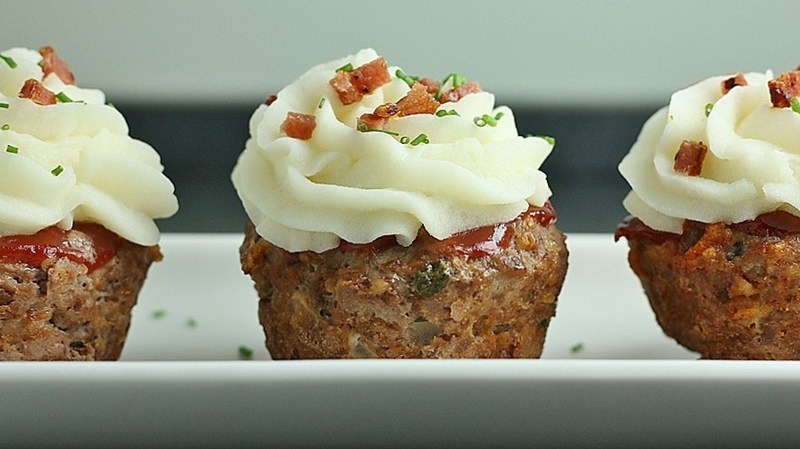 I think these meatloaf cupcakes would be fun to serve after the wedding. I would like to know about how many should I be able to make with this recipe? I believe it makes 12. Ingenious! I love it! This will make an old dinner new again! This is so cute – I would love to have a vegan version of this! Oh, now that would be very interesting! If you find one, let me know! Great,Great,Great!!! I have 4 teenage sons and they loved the cupcake they ate 4 each, I loved watching them enjoy the cupcakes!! There was none left for my hubby but I will be making them again on Sunday!! Thanks again for the recipe Dawn……….. This looks like a great way to bring a meat fush for a church gathering as well!!! I hope to try this some day or a version of it. So – for all your Moms out there – this one is definitely for you. Too bad they aren’t for all of us single dads taking care of our kids. Try crunched up Golden Grahams cereal in place of bread crumbs. Makes the meatloaf to die for! Never have had a kid not like my meatloaf. Pingback: Meatloaf Cupcakes, Oh Yeah! These meatloaf cupcakes are fantastic. I made them today and they are easy, delicious, portable, and sized right. I didn’t have the carrots. They were so good. I will never make a reg old meatloaf again. Thanks. Could you use BBQ sauce in place of ketchup? These sound awesome, but I don’t have ketchup on hand and would hate to make an unnecessary trip title store. Absolutely, that would be delicious! But the family I would cook them for are BBQ fanatics, do you think it would work with bbq sauce? Meatloaf-cupcakes were the winning dish at a recent club meeting. I served 28 people. I added a grilled ear of corn on the cob to each serving and it was a hit. You made my day stress free, enjoyable because I was tired from cooking all day and there were no leftovers to deal with. Thank you for the recipe. Seems simple enough for me to make. not a “mom out there” but I guess I’ll see if a daddy version is good enough for the kids to choke down. We have a Women’s Ministry Team at our Church and often have day retreats. This would be a great recipe for a ladies luncheon! Can’t wait to try it.! Dinner was a success! I’ve tried to make meatloaf before and it was a disaster. This recipe was simple and easy to follow. The presentation looks amazing. I also smothered them in onion gravy! Thanks for sharing! This looks delish! I’m about to make it! I was looking at the picture though. What is the green chunk in the second meatloaf cupcake? Just making sure I’m not missing an ingredient. I will also use chives. I don’t eat beef what can I use instead ? Use ground turkey or ground chicken. I want to make these for Christmas. But what’s the other half cup of ketchup for? I don’t think you mention it. You use it as a glaze on top of the meatloaf before you put into the oven. Enjoy!